Nexera twin size platform bed 343905 can be paired with different Nexera twin size headboards to create a complete bed set. Its unique design gives the impression the bed floats above the ground, giving the entire room an airy feel. Its unique design gives the impression the bed floats above the ground, giving the entire room an airy feel. Fits a standard twin size mattress. No box spring required. 300 pounds weight capacity. 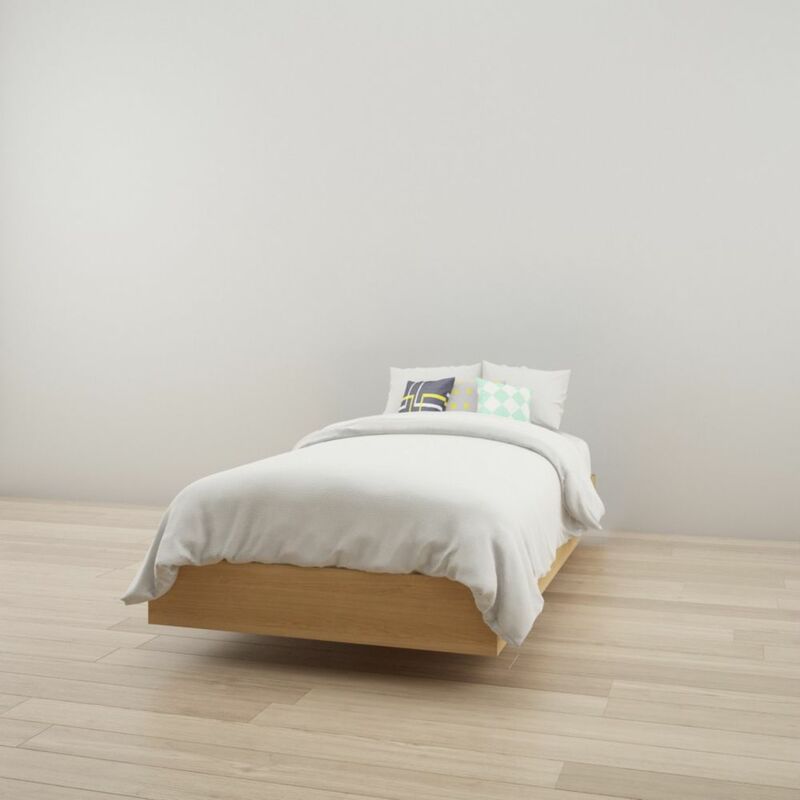 The Cloudzzz Upholstered Bed Base elegantly combines the functions of a mattress foundation and bed frame to create a contemporary stand-alone platform bed. Featuring a simple wood construction design and upholstered in a dark grey tweed fabric, the Cloudzzz Bed Base can create that cozy bedroom you've always dreamed of. Attach your favorite headboard (sold separately) with the included headboard attachment kit for a more lively look and style. The Cloudzzz Bed Base can sit directly on the floor by attaching the feet, or on separate bed frame for a higher profile. Purchase the Cloudzzz mattress with the Cloudzzz bed base to complete the perfect bedroom setting. Kabane Vanity 341605 from Nexera may be used closed and open. When closed, it acts as a writing desk and convenient casual work space in the bedroom. When open, you will find a mirror and enclosed storage space large enough for beauty accessories, bottles, and more. Kabane Collection from Nexera is a contemporary bedroom collection offered in a rich Natural Maple finish with a choice of 3 platform bed sizes - twin, full and queen. The Twin Mates Platform Storage Bed with 3 Drawers does double duty as a bed and dresser. With three generously sized drawers for keeping your linens, blankets and clothes, this bed provides space-saving storage for even the smallest bedroom. No need for a box spring, either: its slat support system only requires a mattress. Position the drawers on either the right or left side of the bed, depending on the layout of your room, and watch your floor space grow! 343905 Twin Size Platform Bed, Natural Maple Nexera twin size platform bed 343905 can be paired with different Nexera twin size headboards to create a complete bed set. Its unique design gives the impression the bed floats above the ground, giving the entire room an airy feel.